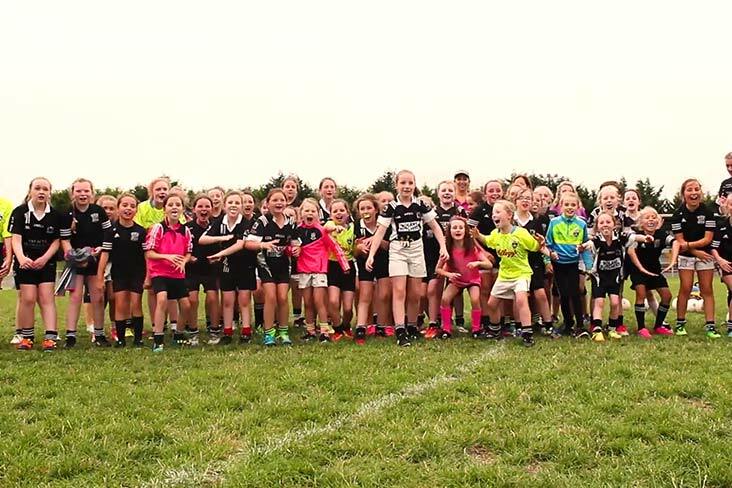 Former Monaghan stars and sisters Niamh and Fiona Kindlon are spearheading a revolution in Magheracloone, using the Go Games model to inspire future players. Niamh, who featured on the last Monaghan team to win an All-Ireland Ladies senior football title in 1997, explains how Go Games ensure that all children who want to play the sport have the opportunity to do so. Go Games allow young players to develop at their own rate and it is essential that counties embrace the concept, and organise Go Games blitzes and activities, as per rule. The environment created through Go Games fosters a sense of fun, a sense of positivity and a sense of encouragement. By having that opportunity to play, young players gain confidence and higher levels of self-esteem. The club featured in this video, Magheracloone, represent a case study of how to apply the philosophy of Go Games, and how to create a culture where the attitude and emphasis shifts from competitive to development-focused. The club uses terms such as 'Tigers' and 'Cubs' to group players, rather than classifying them as 'A' and 'B', for example. Within the club, there was a realisation that things need to change, to ensure that a strong senior team would emerge in the future. Niamh Kindlon explains: "We have quite small numbers as we go up the line. "We have no minor team this year, which is the second time in three years, which is very disappointing but we are hoping that we have such large numbers that they will all follow through and we'll have them playing senior football, which is obviously the key." The 'everyone plays' ethos allows players to develop at their own rate, with 60 girls currently involved at U-12 level. The club has worked incredibly hard in the local community to ensure that almost every girl in that age group is playing football. There's proof positive, too, that the shift in emphasis is working, with the current U14 team containing 24 players who are former U10 players. There's also been a huge buy-in from players, parents, coaches and the club itself, with everyone understanding the importance of giving each aspiring young player a chance, while also affording them to space to enjoy the game and develop at their own pace. Fiona Kindlon says: "We want a senior game, a really good senior team. "We don't feel that if we win back-to-back U12s or we go four years unbeaten…at the risk of losing a child that didn't get a chance. "We'd much prefer to compete, do our best and have a senior club in years to come."